Is Poor Code Quality Affecting Your Bottom Line? Is your organization spending too much time performing system maintenance? Are your developers spending half their day documenting systems and analyzing bugs? Unscrupulous code negatively impacts an organizations in several ways, especially as it continues to expand globally and implement applications within a complex, multi-tier environment. The motivation to enhance software quality stems from two main factors: a desire to improve risk management and a specific need to reduce IT costs. Implementation of design standards, proper analysis, and the use of code quality metrics make it possible to detect less obvious problems up front for better implementation results in a complex infrastructure. What Attributes Boost Code Quality? The reliability of an application determines the risk of failure during implementation. Is the application capable of performing efficiently at run time? What is the likelihood of security breaches or compliance violations directly resulting from the source code? If your organization does not properly monitor software quality, the chances of critical system failures, unknown security breaches, and compliance flaws are much higher. Early problem identification provides the opportunity to boost performance, reliability, and productivity within an infrastructure. Improved code quality also allows an organization to decrease technical debt and associated risks. Code quality analysis provides several benefits when maintaining or implementing applications within a complex infrastructure. 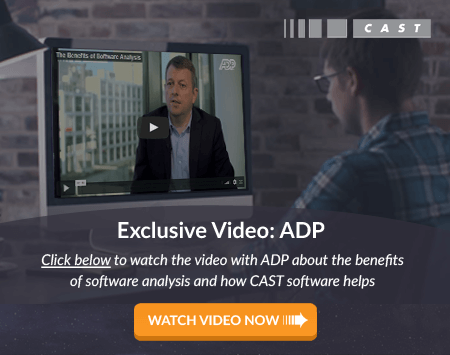 CAST offers a solution for analyzing code quality and regaining control. If unscrupulous code is taking away from organization performance or increasing costs, it is time to consider further analysis to identify these problems long before they cause extensive infrastructure damage. Learn how to improve your bottom line with code quality insight generated by CAST's AAD dashboard. Click here for a free demo.